Find out more and purchase the book here. And you can read three poems by Cynthia Hogue in Issue 11 of Superstition Review. If it’s Wednesday, you won’t find me in my office, not at my desk at home nor the one at work. You won’t find me at the quirky Blue Moose Café, or The Grind just off campus, indulging in reading and writing with a healthy dose of caffeine. You won’t find me in the Robinson Reading Room of the Wise Library at West Virginia University. Instead, you might find me riding the Personal Rapid Transit, or PRT, a monorail that connects the various WVU campuses around Morgantown, traveling from downtown to the Health Science Center. When the doors open at the depot, you might find me climbing stairs and walking across the parking lot towards the Mary Babb Randolph Cancer Institute, making my way to the second floor of the building, to the chemotherapy infusion center. It’s here that I spend Wednesdays, working with patients with cancer, although I’m not a doctor or a nurse. I’m a creative writer. Instead of taking a patient’s vitals, I’m there to take his or her story. The chemotherapy infusion center is a large box; the outside of the box is lined with cubbies, with three walls and a curtain that slides across for some additional privacy. The box’s center contains nurses stations, computers that can be wheeled around to cubbies, The kind of instruments and gear you’d expect to see in a bustling clinic. When I arrive I check in with the charge nurse. She’ll direct me to patients who I might have deliveries for—deliveries not of flowers or lunch but of stories—and or direct me to new patients to work with. New patients, new stories. In October 2015, I met with Dr. Carl Grey. Carl, a young doctor, has a compact, athletic build, blonde hair, thick glasses and a shy smile. He married a woman I knew from grad school who runs the literary imprint of the WVU Press. In my mind, this makes them a power couple. Carl had a clever idea—that patients would be more open to tough conversations with their physicians if those patients had reflected on their lives and values first, and doctors could know those lives and values through expressive writing. But he wasn’t sure how to get started. I’d worked with a dying man, about a year before, helping him craft a memoir. During this time I learned about narrative medicine, and attended workshops run by Rita Charon, MD, PhD. I like to call her St. Rita, because I find her work a miracle. St. Rita believes stories matter, and that the care of sick unfolds in stories. She believes that through these stories we bear witness to lives, and through writing and reading we join in attention, representation and affiliation in ways that make order from chaos. Through my work writing with patients with cancer, I find my view in line with hers. In the chemotherapy infusion center, I get some of those stories, the stories of the patients. I don’t ask about their cancer explicitly, but of course the patients can talk about that if they want. In West Virginia, where I live and work, patients like to talk about work, food, and family. I can’t tell you how many stories include parts of recipes and the food eaten at family events—from barbecue to soup beans, fried chicken to Hawaiian meatballs. Gardens, too. Tomatoes, squash, beans, lettuce, you name it. In West Virginia, telling a good story is considered an art of its own. My storytelling patients range from late teens to over 80 years old. They are all receiving chemotherapy for some kind of cancer, some in early stage, others progressed. Not all, but most are Appalachian, many natives of West Virginia who still live here. Part of the reason I’ve talked in summary about the patient stories is that, under our project, they’re protected by HIPAA. That allows the patient to be in control of their story. We do survey them to see where they end up. Most are shared with family members and friends. To get a patient story, I sit with each, working through a release form and some surveys. One survey collects quality of life information and another collects demographic data. Both will be logged in a secure database so we can analyze the results later. We have a study group and a control group. The study group begins the storytelling immediately, while control group does the story portion at a later date. I’d never thought of writing in these terms before, and it’s interesting learning this world of research. I go through guided questions to get at stories and while I do this I record the conversation. Later, this recording is worked up into a transcript, and from that transcript I work on a first-person account. When I have the story ready, I bring it to the patient in a crisp blue folder. Patients read through and can make any edits they need or want to make. When their story is finished, it’s theirs to keep and share. Most of the patients I work with have never thought to write anything down about their lives, and when I bring their stories, they get excited to read them. One patient, having a tough day in the clinic, actually went from slumped and ashen looking to sitting up, with brightness in his eyes. Carl has often said the stories turned out more beautifully that he imagined. We do file a copy for the study, and he reads every one. Carl and I worked for about six months on grants to help make this project a reality. There have been plenty of supporters, and just as many naysayers. We forged on through the conviction of our belief and a lot of long arduous days writing and revising grant proposals. It pays off: of the first group of patients we’ve worked with, about 20% have been referred for symptom management or participated in Advance Care Planning because of the story project. Advance Care Planning is a set of directives patients create so that their wishes for their care are carried out if they are unable to speak for themselves. It shows one way the arts can have a palpable affect in a life, and how humanities and STEM are better together than in competition. The stories actually lead to improved care. I like to think I might help change health care for the better. I am a rheumatoid arthritis patient, a condition that cut short my progress as a ballet dancer. Writing became a way to deal with that loss, and to forge a new identity. My younger brother is a cancer patient. Diagnosed young, cancer wasn’t just a shock to him but our whole family. Writing has helped me be a better caregiver and sister to him. My brother shares in the excitement about the ways in which writing life stories might better the relationship between doctors and patients. Our writing in the cancer institute is a two-year pilot project. I don’t know what will come at the end of that time. I hope I’ll be able to do more work like the writing I do with patients with cancer. I feel touched, honored, and blessed to work with them. Most of all, I feel humbled. I find myself the caretaker of stories, and it’s an important job. Because of this project, a group of patients with cancer will have a part of their life on the page. What I wish and hope is that these stories are meaningful artifacts for these patients and their families. For my share, the process of making the stories creates meaning for me, and buoys my faith in all the good things that writing can do. I’ve been asked if I get depressed going to work in the infusion center, but truth told, Wednesdays are the best day of my week. I know patients don’t wish to be in the infusion center. Maybe the making of these stories makes their time in the infusion center a little bit better. My work infuses me with hope, spreading through me as if through an IV. A great hope is that more creative writers might have opportunities to do this kind of work. There are many programs people can attend—from the workshops and Masters program at Columbia University, under St. Rita, to more humble workshops, like the one I’m adding to the annual West Virginia Writers’ Workshop. Learning about how others write with patients can lead to new projects and initiatives. I recently learned about the Art for Healing at Yale New Haven Hospital’s Children’s, a program that integrates many art forms in support of healing. There are many, many more. We need to harness this collective power of art and healing. Writing can be a way to personal fulfillment, but writing can also be in service to others. This is one small way. If we have enough small ways, we have something big, changing way we live in the world, word by word, story by story. If we can do it in the heart of Appalachia, where, it seems, nothing comes easy, then I think we can spread it to all the places where people look for care. St. Rita says, “Stories matter.” Believe her. Recently, in my graduate fiction workshop, we were chewing over that vexing subject of the artist’s role in human society. Our discussion stemmed from having just read William H. Gass’s provocative essay “The Artist and Society,” which originally appeared in The New Republic in 1968 and then was reprinted in his 1971 collection Fiction and the Figures of Life. Gass’s theme is a timeless one certainly, dating back far earlier than the 1960’s. How can one not remember Percy Bysshe Shelley’s famous formulation from 1821 that “Poets are the unacknowledged legislators of the world”? It’s a line that sounds grand but has never made much sense to me, to be honest. Unless we take “legislator” to mean something entirely different from what it actually does. I’m from Washington DC. I know about all about legislators. When I was in my wandering twenties and searching for a satisfactory career within which to apply my English degree, I toyed with the idea of finding employment in a congressional office on Capitol Hill. I did end up trying but was unsuccessful in my attempt, probably because I was completely half-hearted in my approach. Deep down I knew that working for a congressman wasn’t really what I wanted to do or what I should do. After all, I had come to the conclusion years earlier, early on in my college days in fact, that while everyday politics seems to get the press’s and the public’s attention, in the long run the arts have a lot more to do with forming human people and human societies; the arts, one could argue, help form the human soul. And how could there be anything more vital and more lasting than that? I was sure then that I was right, and I remain sure now. Indeed, when we look back on past eras it is the political events that we often have a hard time remembering, while it is the artistic accomplishments that we study and revere. And it is those societies whose artistic accomplishments seem minimal that we dismiss as less vigorous and less interesting, less demanding of our attention. But knowing all that doesn’t really help the contemporary workaday artist struggling for purchase in a society that seems indifferent to him or her. It’s unavoidable that artists–whether literary, musical, theatrical, or visual–all go through periods of profound alienation from the culture in which they exist; and I dare say that most suffer a kind of low-level alienation their whole lives. Alienation from institutions; alienation from coworkers; alienation from churches; alienation from the world of commerce; alienation (most painfully) from the families in which they were raised; possibly even alienation from their own spouses. This alienation seems especially acute here in America, where–more than in any other country I can think of–an artist is made to apologize for and explain his or her ambition. Calvin Coolidge famously noted that “the business of America is business.” Sad to say that more than ninety years after that appraisal, with all the social upheavals and revolutions that have since occurred, the statement may be more true now than ever. No one ever asks a businessman to explain his interest in business. No one makes him explain why. No one makes him squirm. Too bad artists are not afforded the same respect. But they aren’t. Period. Hence this blog post and the discussion in my fiction workshop class. So given the climate in this country–a climate that looks to get only more harshly anti-artistic and nihilistically money-grubbing with the advent of the Trump administration–it is fair to ask what’s an artist to do here. What can he or she hope to accomplish? How can he or she ever influence more than a narrow band of people? How can he or she actually affect a whole culture? It’s a common adage about writing that writers take up their pens (or their computers) because they have something to communicate, important messages to pronounce, compelling ideas to pass along. In fact, that perspective seemed to dominate the discussion in my fiction workshop class. One student stated quite plainly that he knew all of his readers “would not agree with [him]” but that didn’t matter; what mattered to him was getting his ideas down and out. He was confident that those ideas would certainly affect someone, and possibly in compelling ways. Another student argued that all the absurd prejudices and false ideas he saw professed by those around him, even those in his own family, maybe especially by those in his own family, would eventually be disproven by science. Science would eventually provide answers to everything, and the force of its cool logic would prove too powerful to deny. We all found this student’s faith in science, and, even more, his faith in his countrymen’s ability to listen to reason, conspicuously naive. As interesting as the discussion was–and it was quite interesting–in the end I felt it missed the boat entirely. Because the truth is I don’t think writers–that is, creative writers, the kinds of writers and writing about which I specialize–write because they have “something to say,” some specific message with which a reader would instantly agree or disagree. If that were true, the job of the novelist would be essentially no different from that of the sermonizer or the philosopher or the editorial writer or–more harshly–the propagandist. In my opinion, those jobs are vastly different from that of the novelist. I can only speak for myself, of course, but I cannot tell you anything in particular that “I have to say,” any singular message or compulsive idea that drives me to write. I write because I want to tell stories. That’s it. That’s what I want to do. And that’s true whether I’m writing a short story, a one-act play, a poem, or a memoir. I want to tell stories that engage a reader’s imagination. After all, this quality is exactly what makes creative writing so different from any other form of written communication. So when I hear terms like “the fiction of ideas” I tense up; not because I don’t think fiction can transmit ideas, but because I worry that a fiction writer who defines himself or herself as such won’t take care of his first and only mandatory duty–to tell a story; I worry she will use the idea of ideas as an excuse to avoid that duty. How do we affect reality? By adding to reality. That’s what a good, well-told story is: a beautiful object added to the sum of what we are as people, what we have done, what we can do. Gass: “The aim of the artist ought to be to bring into the world objects which do not already exist there, and objects which are especially worthy of love.” That’s enough–and that’s everything. A well-crafted human tale matters more than any message. And maybe it matters more than ever now, following a presidential campaign that from its very first day, its very first speech, attempted to “unperson” an entire population, and then went on to “unperson” several others. Maybe the way we “defeat Trump” is to portray reality so broadly, so fully, and so compellingly that even he and his lackeys and his henchmen and his sycophants cannot deny it. And I guess that’s being a legislator for real. Arizona State University Project Humanities released their Fall 2016 event calendar. Events include programs directly sponsored, supported, or created by Project Humanities as well as events that highlight the range and value of the humanities at Arizona State University. You can read more about Project Humanities here. 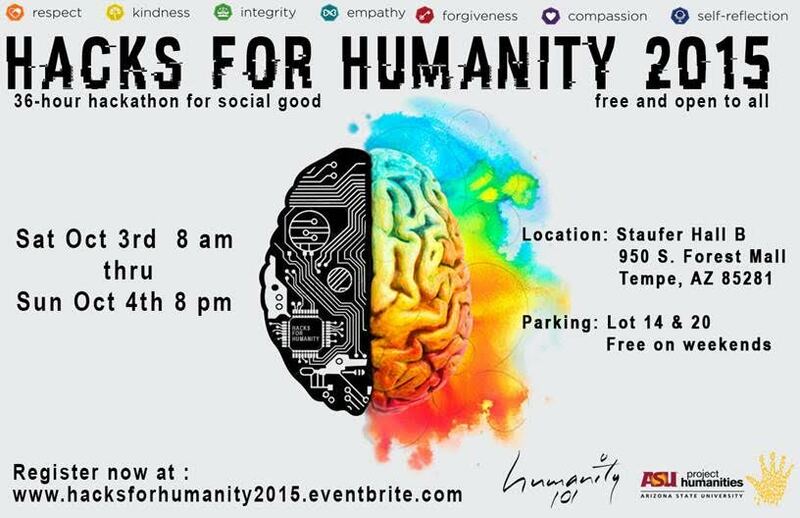 Project Humanities invites you to their upcoming event, Hacks for Humanity 2015. Hacks for Humanity is a 36-hour hackathon for the social good, starting at 8am on Saturday, October 3rd, and ending at 8pm on Sunday, October 4th. They invite techies, programmers, developers, humanities, artists, students, educators, and creative visionaries to hack with one mission: to create technology solutions and initiatives that will contribute to the social good and address the needs of humanity using the seven principles of the Humanity 101 Movement: respect, kindness, integrity, forgiveness, empathy, compassion, and self-reflection. Last year, the winning team went on to win the $10K grand prize from the ASU Changemaker Innovation Challenge last spring for their life-saving mobile application “ARKHumanity.” This team of five determined individuals not only showed their talents in technology, but also their love and dedication to the needs of humanity. Furthermore, they show their everlasting support of our Humanity 101 Movement. You can win Hackathon this year and move on to greater competitions, too! Join for another exciting 36-HOUR event! Sign up for this event here: www.hacksforhumanity2015.eventbrite.com. Each week here at Superstition Review, we like to showcase the talents of our interns. This week’s piece comes from Samantha Allen on her recent discussion with author bell hooks. As bell illustrated through stories from her personal life, these “communities of resistance” aren’t always free of conflict. She shared stories about the people in her life who have acted in ways that are harmful to her and to her views, all the while doing good by supporting her in her work, or by making great strides towards promoting racial equality. She called this contradiction “multiple intentionalities” – when people or groups do both harm and good. How do we cope with these contradictions? Do we ignore the good in someone’s actions because they have also done wrong? Do we overlook the unpleasant qualities so we can continue to idealize them as saints and angels? We live in a binary culture that has no place for contradictions. 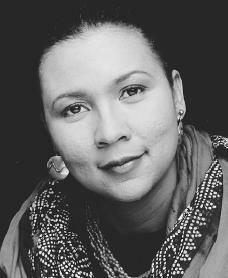 bell hooks used a story about a conflict in the humanities department at Berea College, where she teaches, to discuss how the inability to deal with multiple intentionalities can become an impediment to building communities of resistance. Even when the goals are the same, it’s easy to be divided by our differences. This message of importance in building communities of resistance seemed to resonate deeply with everyone in the room. It’s no secret that Arizona has been the battleground for a number of contentious political issues in these past couple of years. The actions of our state legislature have given Arizona a particular reputation for intolerance, one that conflicts with the values of the Humanities Department at Arizona State University. The ASU Humanities department celebrates diversity and the commitment to social justice. The very act of getting together to discuss these issues with bell hooks is a step toward building a similar community here in the heart of Arizona. Although this state is mired in ideological conflict, it’s important to remember to act with loving-kindness, as bell pointed out in our discussion. No one is black and white; no one acts in only one direction. The concept of multiple intentionalities is particularly applicable to the current cultural climate in Arizona. In the end, the discussion with bell hooks left me with this thought: as artists, writers, and readers, it is our job to tackle these contradictions in life. The human tendency to do good with the right hand and harm with the left is, perhaps, the very thing that drives us to create. How else can we make sense of ourselves and our world with all its contradictions if not through art? I’m thankful to be a part of the community here at Superstition Review, where our interns, contributors, and readers are all committed to the art that makes sense of our crazy, convoluted world.